I arrived back in the United States in December after taking three months off work to live and volunteer in Peru. This was one of the best experiences of my life, and one that I learned many valuable lessons from that I now apply to my life as a Business and Technology Consultant. I wanted to become fluent in Spanish – I had a taste for it while studying abroad in Spain, but never fully grasped the language. I wanted to travel and explore new places – since studying abroad, I had the “travel bug” and felt like South America had a ton of beautiful places to see. All of these were great reasons to go to South America, but there was one major setback – my job. No one my age (26 at the time) just quits their job and travels around the world, and if they did, they were either crazy or had a massive trust fund. This was not my case – at least not the latter. I realized that if I proposed this idea to my boss, I may not have a job waiting for me when I got back. Luckily I was now working for an awesome, small consultancy based out of Denver called Statêra. When I came to my boss about this idea, he was fully supportive and helped me to get all the approvals I needed to take this three-month, unpaid sabbatical. After a long period of networking, researching places to visit and applying to different volunteer positions, I decided to spend my three months in Lima, Peru, where I knew a friend who had recently moved there to discern becoming a consecrated brother in the Sodalitium Christianae Vitae – a missionary order within the Catholic Church. While I originally wasn’t looking to do a mission trip, I did want to help others, and having a friend around was definitely a bonus. I now look back at the experiences that I had over those three months, and can for certain say there is no other place that I would’ve rather spent that time. 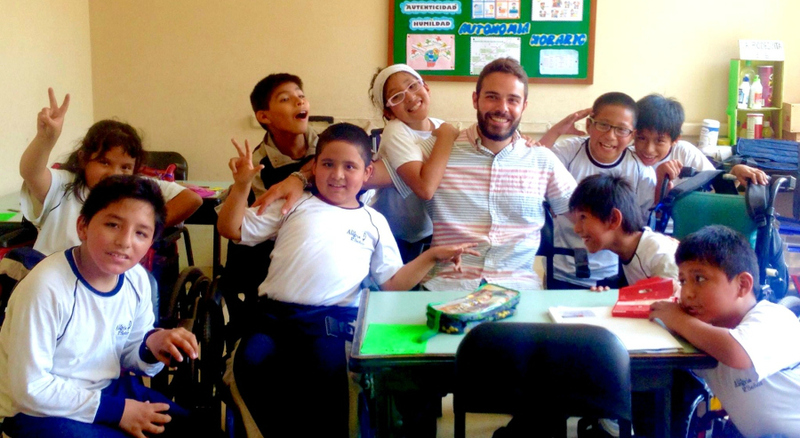 The day after I arrived in Lima, I was introduced to my new workplace, Colegio La Alegría en el Señor: a K-8 school for physically disabled kids, where I would be assigned as an assistant with the 4th grade class. In addition to helping the students with math homework, PowerPoint presentations and drawing, I also had the chance to accompany the kids on a field trip to the beach – the excitement on the students’ faces when we lifted them out of their wheelchairs and brought them into the ocean was an amazing moment that I will never forget. I also participated in a week-long medical mission trip to a small town in the Highlands of Peru, where I was assigned as a translator for the triage team. Because I was not yet fluent in Spanish, this was a bit daunting. However, after spending a night researching medical terms and body parts in Spanish, I felt up to the task. By the end of the week, I and my nurse partner had triaged over 100 villagers, some of whom had previously never seen doctors or nurses. Finally, I had the opportunity to work with Bridges: an organization that assists the poorest of the poor in the shantytowns of Lima. By helping with community-building projects alongside several Peruvian high school students, we were able to build several sets of stairs, serve meals and paint houses for residents of a very poor village outside of Lima. Throughout all these experiences that I had, there was one key message that kept coming to mind: although we may not be able to bring all of these people out of poverty or fix their physical disabilities, we can give them love, and this is far greater than any material gift. It’s honestly pretty easy to build stairs or help out with a kid’s homework. It’s not easy to put your whole heart into it and show them that they are greatly loved. Fulfillment comes from serving others – Instead of constantly worrying about whether or not you’ll receive recognition from the hours of work you poured into that PowerPoint deck, focus instead on taking on a servant attitude of kindness and pouring your best effort into everything you do, without regard to recognition. I understand this goes against every corporate incentive strategy that exists, but the outcome for me has been a much greater level of satisfaction, that extends far beyond the office. Working without a higher purpose is pointless – As American philosopher William James once said, “The great use of life is to spend it for something that will outlast it.” No matter how much money you continue to acquire, true joy and fulfillment in work will not come unless there is an inner motive to serve a greater, selfless purpose that goes beyond immediate gratification. I witnessed this in the immense joy exhibited by so many of the brothers I worked alongside in Peru, who dedicated their lives to serving others without concern for themselves. With the right mindset, you are capable of anything – If you thought presenting implementation proposals to global CIOs was scary, try walking into a village of impoverished farmers and being expected to triage all of their ailments in a foreign language. Although this would have seemed like an impossible task before taking my sabbatical, everything worked out in an amazing way and I got to witness a deep amount of gratitude as doctors treated everything from rheumatoid arthritis to tuberculosis. This proved to me that nothing is impossible when you let go of fear, have faith and focus on doing your best in the situation that’s in front of you. Although it seemed somewhat crazy at the time to take three months off work to travel to Peru, the values that I learned and the joy that it’s given me in my life and work make it one of the best investments I could have ever made. I strongly encourage anyone considering something like this to take a leap of faith and make it happen. Doing something out of the norm could surprise you with great experiences that will last a lifetime. Adam Henrichs is a Senior Consultant who has been working in Statêra’s Business Transformation practice since Spring 2013. Prior to joining Statêra, he worked for Deloitte Consulting, where he served as a Business Technology Analyst and Consultant within the Oracle service line. In his free time, Adam enjoys going to concerts, snowboarding and brewing beer.